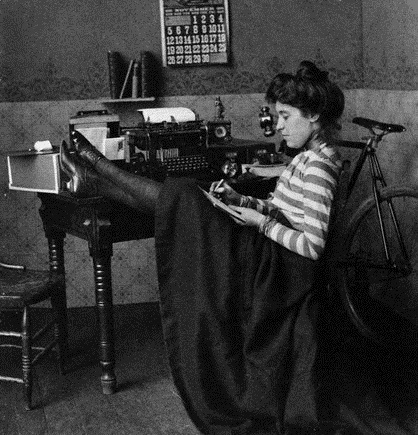 As "Type Rider" Maya Stein makes her way across America, celebrating her 40th on a 40-day odyssey, by cycling with typewriter 1300 miles from Amherst, Massachusetts, to the home of the typewriter in Milwaukee, Wisconsin, (last heard from overnight in Johnstown, Pennsylvania) she may be amused to know that in 1897, typewriters on bicycles were considered a handy military device. Maya, by the way, is stopping along the way, setting up a mobile typing booth, and inviting people to contribute their words to a growing poem. How timely! I'm taking a Corsair on my bike this week! Interesting to see that bicycles were nicknamed "wheels," I didn't know that. The article, published just before the automobile explosion, suggests an alternate history where the internal combustion engine was never perfected and the bicycle remained the vehicle of choice for billions. The planet would have been better off. LOL Richard. I chuckled too at the fact that the subhead "odd uses" came AFTER the the type-cycle. 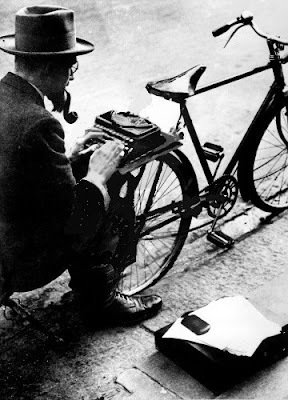 I don't know about the bicycle typewriter, but there have been several very successful military bicycles that I know of. In the beginning, I believe they were a sort of substitute for horses. Now they're useful because they are a comparatively quiet vehicle that does not require refueling.